Blockchain music platforms may rival the biggest streaming platforms soon. Everyone in the music industry knows how hard collecting royalties is. A recent article on Entrepreneur states there are 2,5 billions of uncollected royalties in the music business. Millions of artists are left without the payout they are entitled to. It’s worth adding the very small amount artists make from streaming itself. To meet the minimum US wage of $ 1,260 per month, signed artists would need over 1 million streams a month according to Information Is Beautiful. Even the largest streaming platform Spotify with over 140 million subscribers fails at rewarding artists fairly. Blockchain — as a technology that allows better data management and tracking of digital work — could help musicians collect their royalties and generate alternative sources of income. Is the subscription model soon over? Why the pay-per-stream/ download model works better over the subscription model? Let’s explore. Why the subscription model will end soon? Artists face the following scenario often: “I want to get discovered, reach more fans, and get paid fairly so I can support my career”. Yet most artists remain unpaid from streaming itself while being at risk of theft or illegal downloads of their music from fraudulent users or third-parties. Plus, the subscription model works on volume and is based on the number of streams for musicians to get paid. Finally, fans pay up to USD 9 a month on most streaming platforms to listen to music; yet musicians only receive 12% of the music industry’s 43 billion revenue in 2017. While the streaming and music downloads reached over 3 million USD in Europe and 6 million USD in the USA, artists’ revenue from streaming has declined. Why? The subscription model has created huge gaps between listeners and their favorite artists. Record producers can’t make a living out of streaming and listeners are not encouraged to support musicians. The subscription model only benefits intermediaries and the service provider that links musicians and artists together. So why should fans and artists continue paying expensive streaming platforms while seeing little or no return on investment? 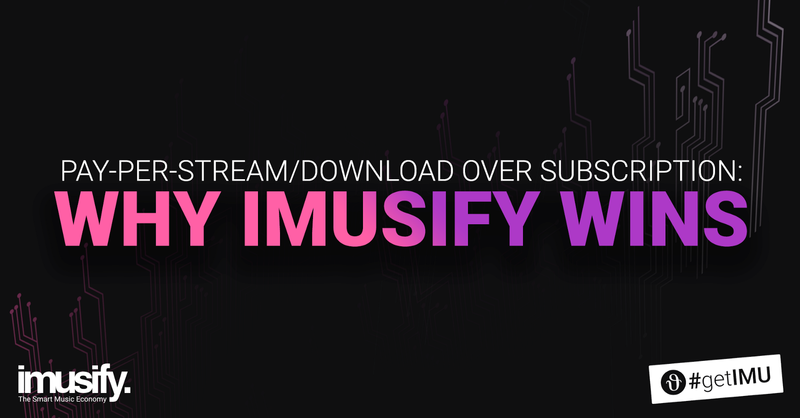 At the heart of the blockchain revolution, imusify has launched an innovative platform that does not charge users for listening or uploading music. With multiple rewards available on imusify — another great promise of blockchain as a decentralized technology — musicians and listeners can simply perform actions for free and even get compensation for their participation. Artists can receive instant payments thanks to blockchain technology anytime someone listens to their music meaning there’s no need to work on volume. Hence, it’s quality that matters and active participation where fans are encouraged to vote, comment, like or listens to music they love. Unlike the other streaming platforms based on the subscription model, users on imusify don’t see ads and can split the revenues from streaming together. The system works because it’s based on a solid cryptocurrency — IMU — which acts as a means of payment within the entire ecosystem. Musicians can furthermore raise funds or sell part of their IMU tokens whenever to support their financial objectives. In short, anytime an action is made on imusify, users are rewarded in IMU tokens that circulate throughout the platform, benefiting both fans and artists. The subscription model is doomed to failure since it creates enormous gaps between the payouts artists should receive and the little money they get in reality. Without mentioning the amount fans waste on subscriptions knowing this money doesn’t reach artists’ pocket. Because of the rise of blockchain as a solution to provide fairer revenues for musicians, while encouraging fans to interact, we believe new forms of music consumption may emerge within the next decade. imusify promotes the smart music economy where this direct fan-to-artist model works to support the new music industry.